from 360 pcs. 0.13 CHF ea. 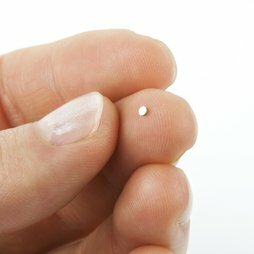 Despite its tiny size, this disc magnet with a 1.5 mm diameter and a height of 0.5 mm still has an adhesive force of 30 g.
5 pcs. 1.14 CHF ea. Here you can see the size of a single disc compared to a ring. The little disc has enough power to hold this paper origami crane.